When I first walked the Statesboro bog, it was home to hundreds of yellow pitcherplants. Their abundant pitchers caught the hard summer sun, transforming it into resplendent green light. Martha Joiner, the site’s “Botanical Guardian,” recalled prior visits. “We’ve seen white-fringed orchids here, plenty of grass-pink orchids, too, and we used to see purple honeycomb-heads,” she said. Since the mid-1990s, Joiner had monitored the bog for the Georgia Plant Conservation Alliance, in cooperation with Georgia Power. That August day we saw blooming slender marsh-pink, candy-pink tufts of Barbara’s buttons, graceful white water dropwort, and occasional orange bursts of bog-cheetos peeking from below thick grassy foliage. However, looming over all were construction vehicles that had graded the surrounding slopes for a housing complex. Martha, fellow Botanical Guardian Alicia Garcia and I were visiting the site to determine if we could rescue any portion of the bog. We were too late to influence the development. Yet we had hope. Many had answered Joiner’s call for help to move and find homes for the plants. Construction planners for the site had also offered to help. 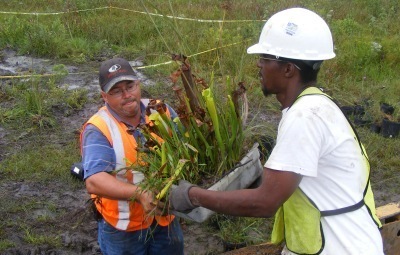 Read DNR botanist Lisa Kruse’s full blog post on the Statesboro bog rescue! You'll find more pictures on Flickr, and a profile of Martha Joiner, TERN's 2010 Volunteer of the Year, here. 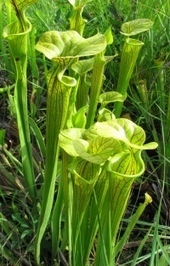 The yellow pitcherplant, also called yellow trumpet pitcherplant and yellow flytrap, is probably the most common of Georgia’s pitcherplants, historically occurring in at least 42 counties. The species is state-protected and was originally added to the list because of the threat of poaching and commercial exploitation. 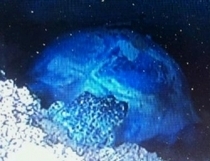 However, much of the plant’s habitat has since been destroyed and many of the older populations are gone. The sediments that accumulate in bogs and wetlands in the southeastern U.S. serve as important archives of environmental history. Collecting and analyzing sediment cores from these sites offers a way to chart changes in local and regional environments over time. For example, pollen grains in sediments provide evidence of vegetation at different times in history, and charcoal particles attest to past fires. Last month, Nongame Conservation Section botanist Dr. Mincy Moffett and Carrie Radcliffe, a former Nongame Conservation intern, guided three University of Tennessee researchers to remote mountain bogs on the Chattahoochee National Forest in Rabun County. Drs. Sally Horn and Henri Grissino-Mayer, along with doctoral student Mathew Boehm, all from the university’s Geography Department, are exploring bogs in North Carolina and Georgia to find suitable sites for studies of long-term environmental history. 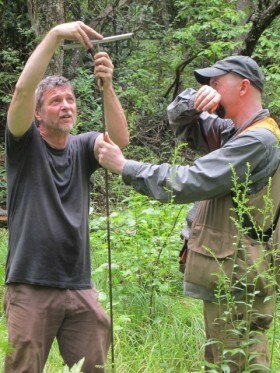 Their recent trip to Georgia focused on mountain bog complexes at Hale Ridge and Keener Creek. The researchers found the Sedge Bog within the Keener Creek bog complex particularly promising. This small bog covered in a thick carpet of graminoids, most of them sedges, “Looks to be a unique site with deeper sediments and less human disturbance than we've seen at other bogs in the Appalachian region,” Horn said. Future explorations are planned for mountain bogs in Union County. Like most other wetlands, bogs trap sediments that run off from surrounding areas. Over time, uplands erode and their sediments – including organic matter from organisms, pollen, charcoal from fires and other sources – move into and along the watershed. If the local geologic, topographic and hydrologic conditions are right, the sediments are trapped in the bog, instead of eventually flowing to the ocean. Deeper sediments reflect older depositional events. Once trapped, under certain circumstances the organic material is preserved or fossilized. Heavy, wet sediments are compressed, compacted and quickly become anoxic, or severely deficient in oxygen. The anoxic conditions, coupled with the cool, acidic nature of mountain bogs, preserve the organic component of the sediments from the normal processes of decomposition and oxidation. Here's a quick overview on DNR efforts to restore mountain bogs. One of several bogs in the Keener Creek bog complex on the Chattahoochee National Forest. About a 10th of an acre in size; covered with graminoids. Restoration efforts have removed most woody species. Bog is accented with outplanted swamp pink, now mature enough to bloom and reproduce, and a robust, naturally occurring population of kidney-leaved grass-of-Parnassus. Organic sediments, above the rocky substrate, are 10-plus feet deep and appear well preserved. Gopher tortoises are going strong at Moody Forest Natural Area, with more juveniles and sub-adults than normal – about a quarter of the tortoises found. The healthy recruitment, documented in surveys by the Nongame Conservation Section and The Nature Conservancy, likely points to growing numbers for Georgia’s state reptile at the natural area near Baxley. Editor's note: In the photograph, the frog is in front of a gopher tortoise (you can see the tortoise's shell)! Amos Tuck’s odyssey – a recent three-week, 200-mile float trip in the Coosa River basin – is documented in words, photographs and video at the Coosa River Basin Initiative’s Musselhead Blog. Tuck, a former Nongame Conservation Section intern, is program coordinator of the Coosa conservation organization. Put your inner scientist to work through SciStarter, a website that helps connect citizen-science projects with science-minded citizens. Plug into projects varying from worldwide views on biodiversity to sighting banded American oystercatchers and reporting invasive brown marmorated stink bugs. The “Allure of the Altamaha” is capably captured in this Nature Conservancy magazine feature. Former President Jimmy Carter also offers his thoughts on how to think about rivers and streams, and the need to conserve them. +video "At least 200,000 tons of oil and gas from Deepwater Horizon spill consumed by Gulf bacteria," University of Rochester. Video interview with study co-author. It was no day – or season – at the beach for beach-nesting birds in Georgia this summer. 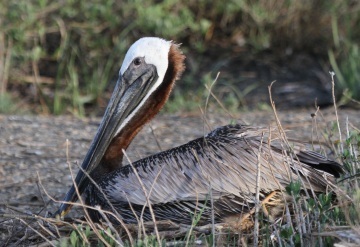 High-tide events, from the super Moon in May to tropical storms Beryl and Debby, flooded scores of nests, including 538 brown pelican nests washed over on Little Egg Island Bar, according to Nongame Conservation Section botanist Tim Keyes. Predators such as raccoons and fish crows also took a toll. There were highlights, however. One that Keyes noted is St. Catherines Island bar, inactive for several years but one of the largest seabird colonies of 2012 with 230 black skimmer nests, 65 gull-billed tern nests and 46 least terns. Also, a Georgia Ornithological Society grant provided electric fencing to help protect nests on Andrews and Little St. Simons island, adding to new fencing efforts that kept some raccoons, mink and coyotes at bay. 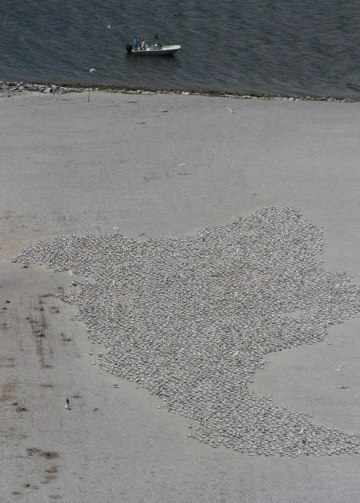 Pictured top left are some of the thousands of royal terns that nested on the Brunswick dredge island. At bottom left, brown pelicans persevered in nesting on a relatively protected marsh island behind Cumberland Island.